On offer from us is a wide and attractive collection of Floor Cushions. These are made using plain and printed fabric with cotton or polyester filling, which is sourced from reliable vendors of the market. Offered by us in a variety of sizes, colors, designs and shapes like round, square, cube & puff, the cushions we offer are known for their attractive looks, softness, amazing finishing and unique patterns. 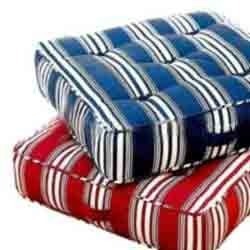 Further, patrons can avail these cushions from us at market leading rates. Founded in the year 2007, A.S. International is an ISO 9001:2008 certified company which are counted Manufacturer, Supplier and Exporter of a quality assured range of Children Cushions, Shaped Cushions, Flower Cushions, Transport Cushion, Kids Bedding, Cot Bumper, Valance Bedding Sheet, Baby Bedding Sets, Printed Bed Quilts, Cotton Bed Quilt, Designer Cotton Bed Quilts, Handmade Bed Quilt, Pathwork Bed Quilt, Kids Bed Quilt, Bean Bag Sheep, Bean Bag Tiger, Elephant Bean Bag, Puff Bean Bags, Cartoon Kids Hanger, Decorative Kids Hanger, Kids Hanger etc. These products are developed using finest quality cotton, silk, polyester, viscose, jute and wool as per latest fashion trends. Customers can avail all our products in varied colors, designs, patterns and sizes in order to meet their needs. Owing to the features like fine finishing, color-fastness and appealing designs, our products are highly demanded among the customers. A.S. International assisted by a team of diligent tailors, which enables us in accomplishing the business operations in a streamlined manner. The experts working with us are updated with contemporary fashion trends, which they put in while stitching the offered range. Moreover, our professionals keep in close touch with the patrons to know their exact preferences and after that bring them products accordingly. All these professionals are responsible for proper management of all the activities of our activities. Owing to all the above mentioned factors, we have been able to spread our wings across U.K., Europe, USA, Australia and Latin America.